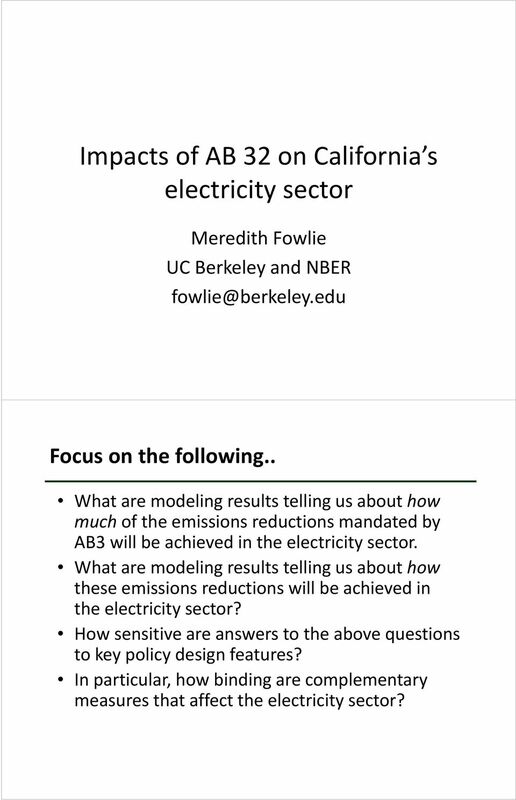 Download "Impacts of AB 32 on California s electricity sector"
1 Impacts of AB 32 on California s electricity sector Meredith Fowlie UC Berkeley and NBER Focus on the following.. What are modeling results telling us about how much of the emissions reductions mandated by AB3 will be achieved in the electricity sector. What are modeling results telling us about how these emissions reductions will be achieved in the electricity sector? How sensitive are answers to the above questions to key policy design features? In particular, how binding are complementary measures that affect the electricity sector? 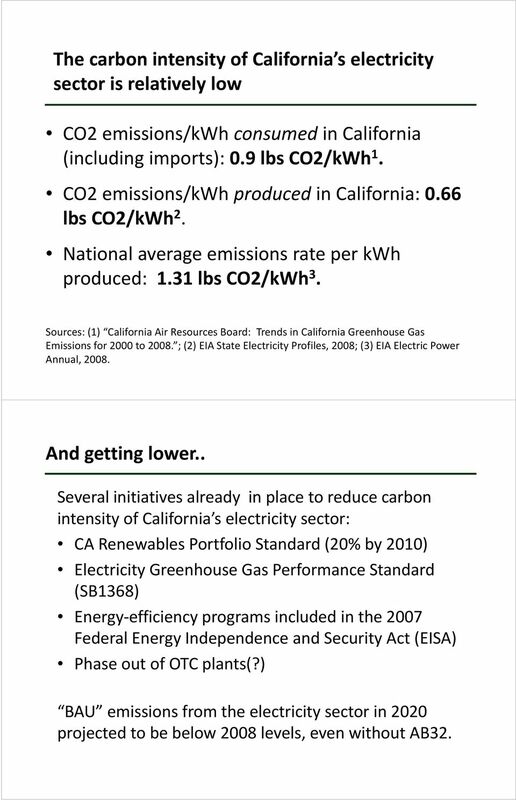 3 The carbon intensity of California s electricity sector is relatively l low CO2 emissions/kwh consumed in California lf (including imports): 0.9 lbs CO2/kWh 1. CO2 emissions/kwh produced in California: 0.66 lbs CO2/kWh 2. National average emissions rate per kwh produced: d 131lb 1.31 lbs CO2/kWh 3. 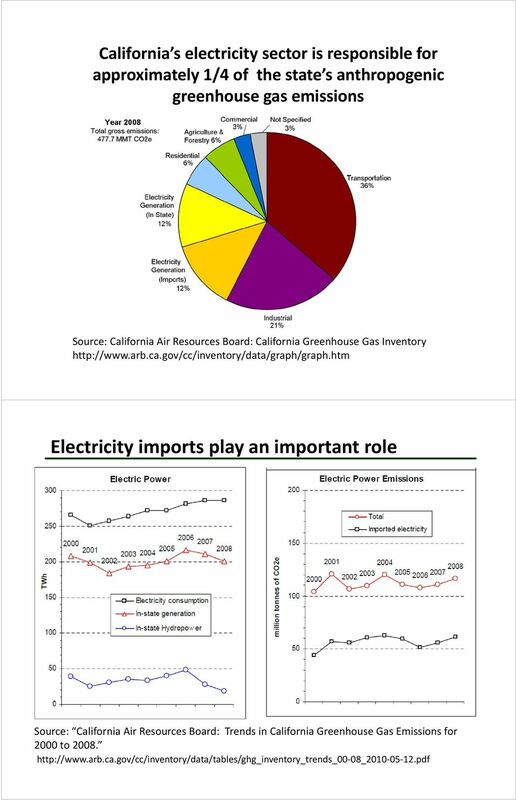 Sources: (1) California Air Resources Board: Trends in California Greenhouse Gas Emissions for 2000 to ; (2) EIA State Electricity Profiles, 2008; (3) EIA Electric Power Annual, And getting lower.. Several initiatives already in place to reduce carbon intensity of California s electricity sector: CA Renewables Portfolio Standard (20% by 2010) Electricity Greenhouse Gas Performance Standard (SB1368) Energy efficiency y programs included in the 2007 Federal Energy Independence and Security Act (EISA) Phase out of OTC plants(?) 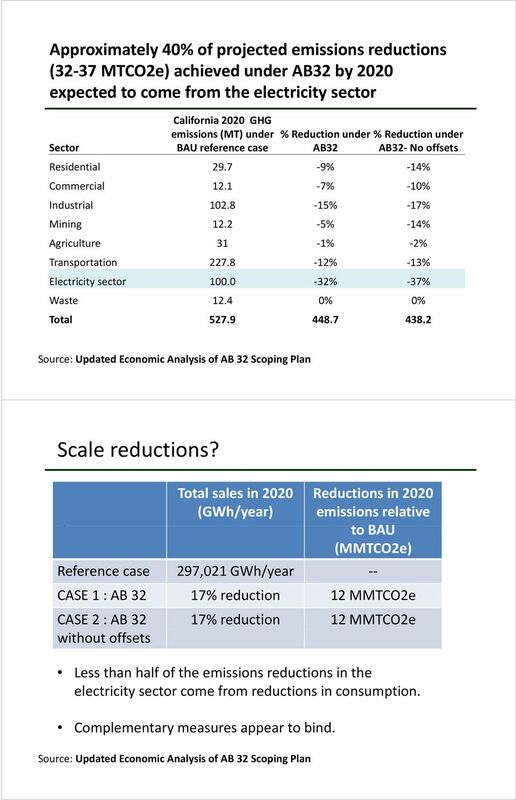 BAU emissions from the electricity sector in 2020 projected to be below 2008 levels, even without AB32. 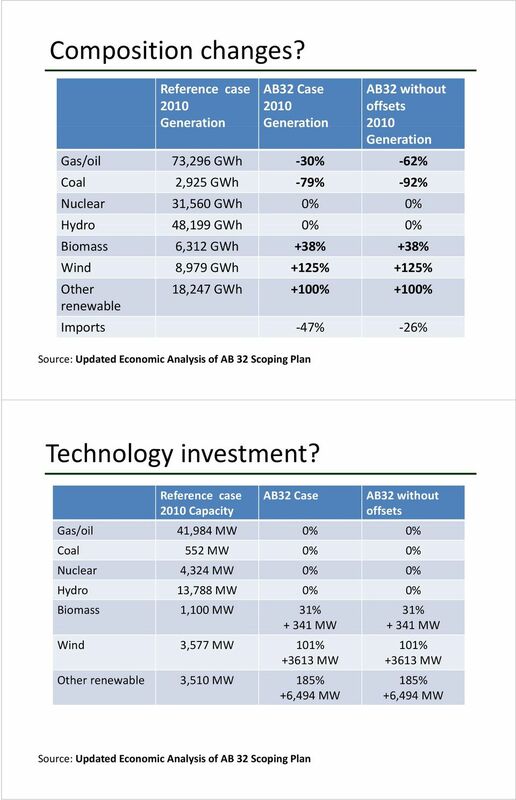 4 Electricity sector is expected to contribute significantly to emissions reductions achieved under AB32 In economic analysis conducted by CARB, approximately 40% of projected emissions i reductions achieved under AB32 by 2020 come from the electricity sector. How these emissions reductions will be achieved depends to a significant extent on how the policy is designed and implemented. How will these additional carbon emissions i reductions be achieved? Scalereductions? Rd Reduce load. Composition changes? Reorder dispatch of existing generation so as to increase (reduce) capacity factors of low (high) emitting units. New technology investment? Build new, clean generation to displace relatively highemitting generation on both the operating and build margins. 5 Projecting emissions trends in California s electricity it sector (out tto 2020) A variety it scenarios have been analyzed. 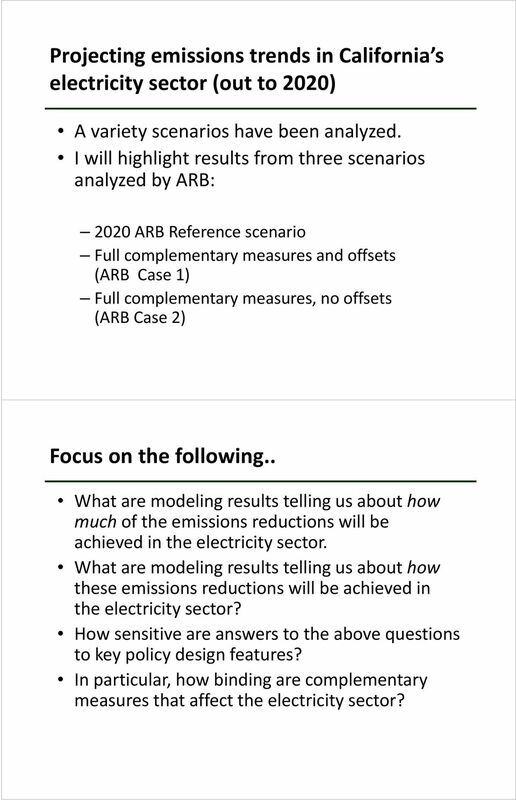 I will highlight results from three scenarios analyzed dby ARB: 2020 ARB Reference scenario Full complementary measures and offsets (ARB Case 1) Full complementary measures, no offsets (ARB Case 2) Focus on the following.. What are modeling results telling us about how much of the emissions reductions will be achieved in the electricity sector. 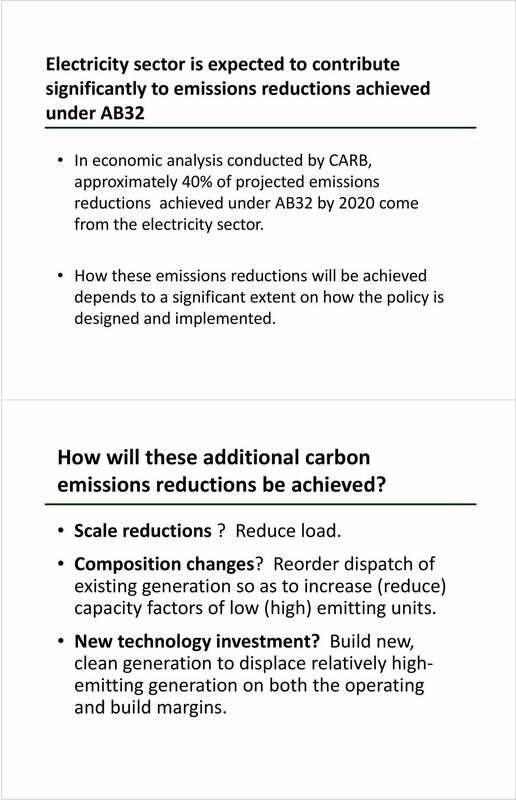 What are modeling results telling us about how these emissions reductions will be achieved in the electricity sector? How sensitive are answers to the above questions to key policy design features? In particular, how binding are complementary measures that affect the electricity sector? 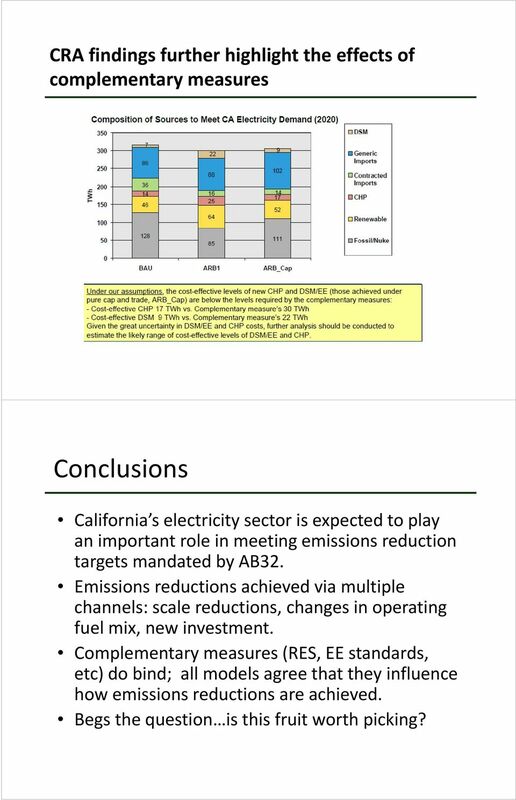 8 CRA findings further highlight the effects of complementary measures Conclusions California s a electricity eect ctysector is expected epectedtoto play pay an important role in meeting emissions reduction targets mandated by AB32. Emissions reductions achieved via multiple channels: scale reductions, changes in operating fuel mix, new investment. t Complementary measures (RES, EE standards, etc) do bind; all models agree that they influence how emissions reductions are achieved. Begs the question is is this fruit worth picking? SaskPower CCS Global Consortium Bringing Boundary Dam to the World Mike Monea, President Carbon Capture and Storage Initiatives 1 Purpose of Today A. CCS around the world B. What SaskPower is doing C.
Nuclear Power s Role in Enhancing Energy Security in a Dangerous World Al Shpyth, B.A., M.E.S. Director, Government Relations Cameco Corporation Introduction: Should we be concerned about energy security? Consumer Cost Effectiveness of CO 2 Mitigation Policies in Restructured Electricity Markets. Jared Moore and Jay Apt. Kilian GROSS Acting Head of Unit, A1, DG ENER European Commission 1 Climate and energy: where do we stand? 2008/2009 2011 2014 The EU climate and energy package 2 Climate and energy: where do we stand? Appendix A: GHG Inventory Citrus Heights Greenhouse Gas Reduction Plan Page A - 1 This appendix provides a description of existing and future projected greenhouse gas (GHG) emissions in Citrus Heights. Low-Carbon Development for Mexico () World Bank LCR Sustainable Development Department March 17, 2011 Questions for Low-Carbon Studies What does a low-carbon pathway look like? How much might it cost? How Will Wind Energy Affect Air Pollution? Solar thermal power plants are technologically wellunderstood and have the potential for large-scale electricity generation! How successful have state schemes been in supporting renewable energy and energy efficiency? Ric Brazzale March 2013 www.greenenergytrading.com. Renewable Energy. 2015 LORD Green Real Estate Strategies, Inc.